The right test data management solution accelerates time to value for business-critical applications and builds relationships and efficiencies across the organization. 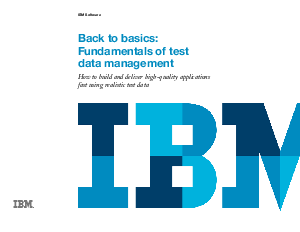 IBM InfoSphere Optim Test Data Management closes the gap between DBAs and application developers by providing all teams with accurate, appropriately masked and protected data for their work. Developers can confirm that new application functionalities perform as expected. QA staff can validate that the application performs as intended based on the test cases, and that integrations work properly. And business leaders can be more confident that competitive functionality will be delivered on time with less risk.